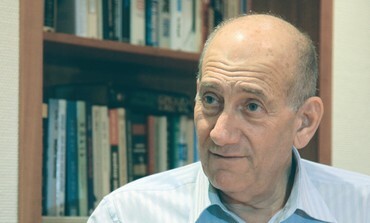 Olmert accused Netanyahu of “declaring war on the United States” and of attempting to incite the Congress against U.S. President Barack Obama. Olmert spoke Sunday at a closed panel discussion on “the strategic implications of the interim agreement between the P5 + 1 and Iran,” held at the Institute for National Security Studies at Tel Aviv University. Olmert said both his government and that of his predecessor Ariel Sharon wished to avoid public confrontation with the American administration over Iran. “At no stage did we want to do battle with Israel’s number one ally and to incite the Congress against the president,” he asserted. Olmert called Netanyahu’s acts and statements unprecedented. “The danger and the potential damage from it are incomparably larger” than the value of the public debate with the United States, he said. When Netanyahu took office in 2009, he changed Israeli policy in favor of “declarations” and “threats,” Olmert said. Olmert rejected the claim that Netanyahu’s threats led to the severe sanctions that brought about the compromise with Iran, and said that these started even before Netanyahu took office.